All Middle Schools in the Olympia School District are fielding Varsity Robotics Teams for this year’s international FIRST LEGO League (FLL) competition. Just like varsity sports, these after-school teams are an opportunity for experienced students to take their Robotics, Science, Technology, Engineering and Math skills to the next level. Reeves middle school has three FLL teams, while ORLA Jefferson, Marshall and Washington middle schools have two teams each. Teams have worked hard on this year’s challenge, Nature’s Fury. The teams are required to design, build and program autonomous robots to complete several time-sensitive Robot Game missions, as well as research, develop and present their Project solution to an engineering problem. This video describes Nature’s Fury Robot Game, while this video shows a robot completing the missions from the previous year’s game (Body Forward). The process for developing the research Project for Nature’s Fury is described in this video. 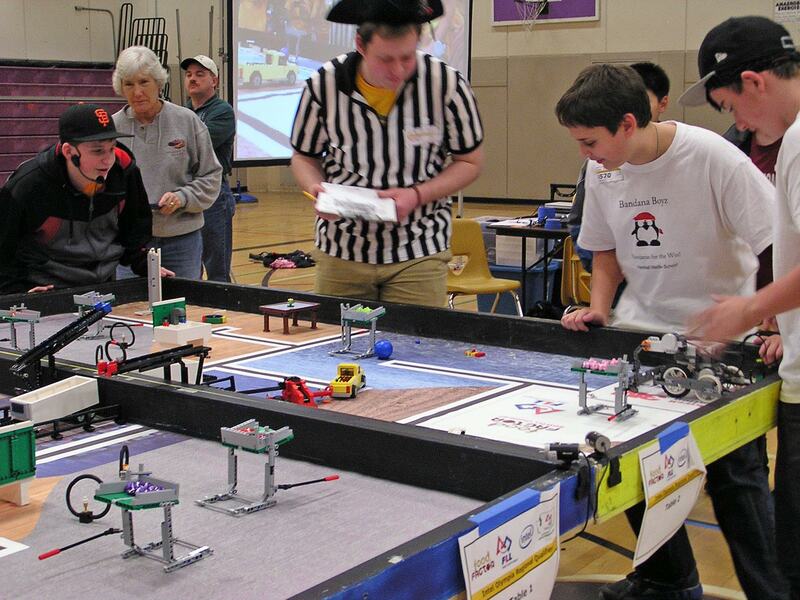 On Saturday, January 11, the Leg’ O Lords and Cubic Crusaders from Marshall Middle School, the Alpha Techno Pod and Destruction Pod from ORLA, and the Brick Bulldogs and Team Delta from Washington Middle School will head to Spanaway Middle School for their Regional Qualifier. The next day, Sunday January 12, the Electrons and Insert Name Here from Jefferson Middle School will be joined by the Sparkly Unicorn Ninjas, Team Waffles and Team Hypersonic from Reeves Middle School, also at Spanaway Middle School. Come cheer on your favorite team as they strive to earn a spot at the Western Washington FLL Semi-finals.